Almost two months ago I received the chance to try out a ton of new products from Campbell's, compliments of Crowdtap. I was pretty excited when I found out that I was one of the few people chosen to test these products. For one, this is great because it means that I won't have to worry about what I am making for dinner. In addition to that, free food is everything for me....especially since I am a college student. Most of the products I received were soups and sauces. I ended up coming up with my own recipes, in addition to simply cooking some of the "ready to eat" soups. Here are my thoughts on all of the products that I received. This Campbell's Soups for Easy Cooking in the Savory Portobello Mushroom flavor was delicious. I poured it on top of pasta and beef with a mixture of spinach. The soup made the pasta mixture very flavorful. I let the soup simmer in with the pasta mixture for about 15-20 minutes. My entire family loved it. 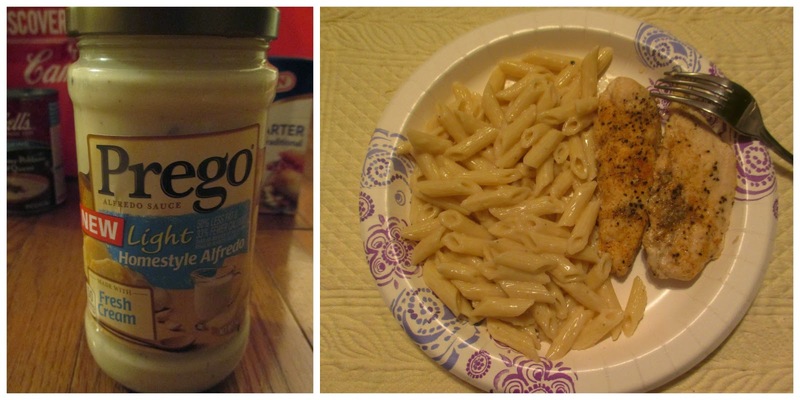 I made chicken alfredo pasta with the new Prego Light Homestyle Alfredo sauce. I even created a recipe for it. This sauce was definitely worth trying out and even worth becoming apart of a biweekly dinner routine. I used the Swanson Cream Starter for a chicken and rice sauce that I made. I added a little garlic and lemon into the cream with oregano. It tasted amazing. The cream wasn't too thick or too thin. It was just right. I actually think it tasted better with the seasonings I added. I used the Campbell's Creamy Poblano & Queso soup for a sauce for some enchiladas I made. It tasted scrumptious. However, I probably wouldn't eat this soup by itself. It is definitely as it says on the can; "Great for Cooking.."
I used to eat Campbell's Spaghetti O's quite a bit when I was younger. Even though I haven't eaten them in years, I can still remember how it tastes. I actually gave this to my baby brother to eat and he enjoyed it. After he finished eating it, he suggested that I buy some more for him to eat. He wouldn't stop asking me about it. This Creamy Parmesan Chicken Campbell's Skillet Sauce was pretty good. All you have to do is simply add chicken to it. I added a bit of garlic salt and Lawry's seasoning salt to it. It made the chicken taste like all types of creamy, delicious love. For a college student, Campbell's Chunky soup is a definite ideal meal. It's affordable and there are so many different kinds to try. I'm not going to lie, I was skeptical about this Campbell's Chunky Beer-n-Cheese with beef and bacon soup. I absolutely despise beer and I know that usually when you cook with alcohol the taste usually dissipates, but it's just the fact that it's beer. Unfortunately, I only had the chance to try a spoonful of this because my family members ended up completely devouring it when I wasn't home. Needless to say, they loved it. The Campbell's Slow Kettle Style Roasted Chicken Noodle Soup was the first item I tried. Here's my full review on it here. I evaluated the taste and decided if it was "College Food Worthy." 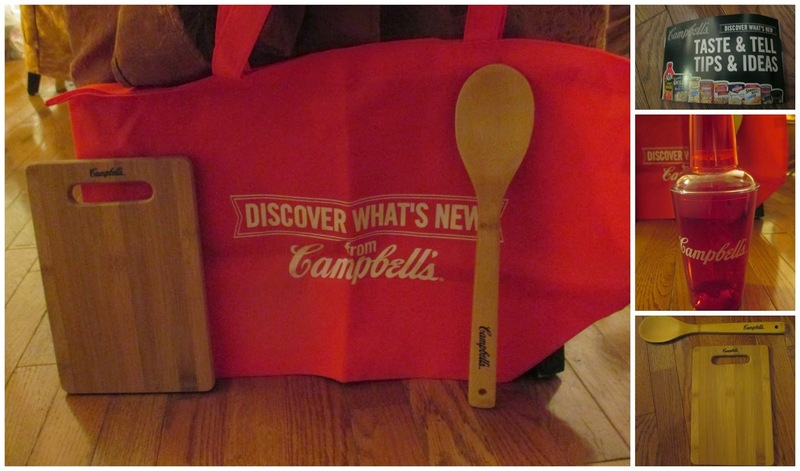 I also received a chopping board, wooden spoon, tumbler, "Discover What's New" tote bag from Campbell's, and a little booklet full of coupons which I thought was a neat surprise. I currently use the tote bag when I go shopping and it's come in handy. I plan on making the cooking utensils apart of the little additions to my kitchen when I move into my new place. 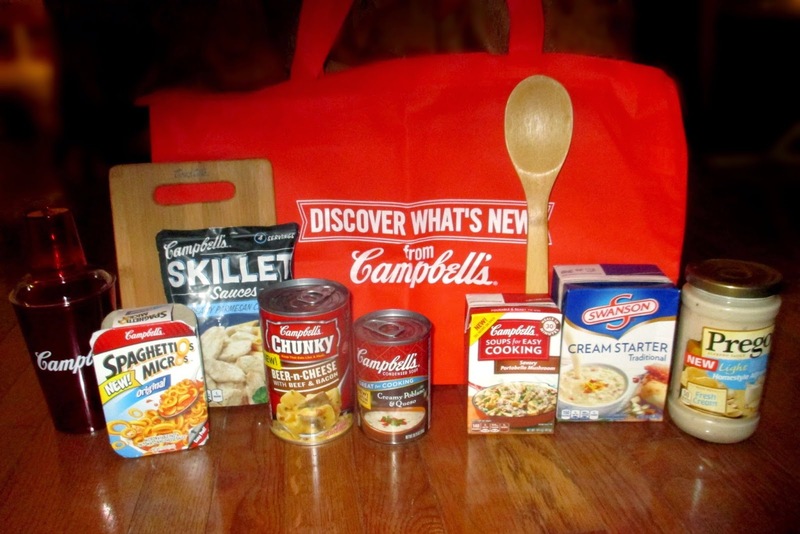 Overall, I am really happy with all of the Campbell's products that I received from Crowdtap. They were delicious and they made cooking dinner easy. I will definitely be buying more of the soups and sauces. They are ideal food staples for any college student. *Products were given to me for free to test from Crowdtap.